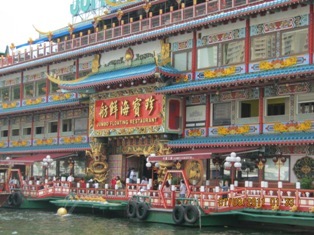 When I was a little boy, my parents took my siblings and me to Jumbo Floating Restaurant located in Aberdeen, Hong Kong. From time to time, the images of this restaurant flashed back in my mind because it was a very beautiful dining place. On our Hong Kong trip this time, my family, my eldest sister, my mom, and I visited this exquisite restaurant. At the pier, we took a small boat to travel to the place. In the boat, we glanced around the harbor and noticed other small boats called sampan running here and there. 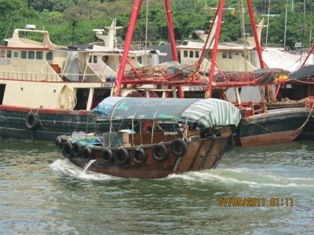 These sampans were for fishing or were rides for visitors. When we arrived at the restaurant, we were seated. After ordering food, my family and I sat in chairs designed like those of the royal court for the emperor and the empress, and my sister took photos of us. 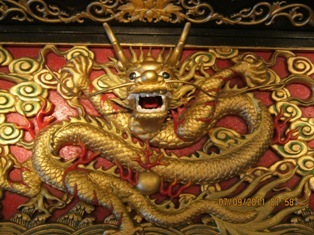 For the rest of our time there, we enjoyed the delicious dim sum and the comfortable environment. Afterwards, we ascended to the upper deck to take a look at the harbor. We ended our day at another restaurant in the Hong Kong Island. This entry was posted on Thursday, July 28th, 2011 at 11:20 pm and is filed under Hong Kong. You can follow any responses to this entry through the RSS 2.0 feed. Both comments and pings are currently closed. What a delightful excursion! So beautiful too.